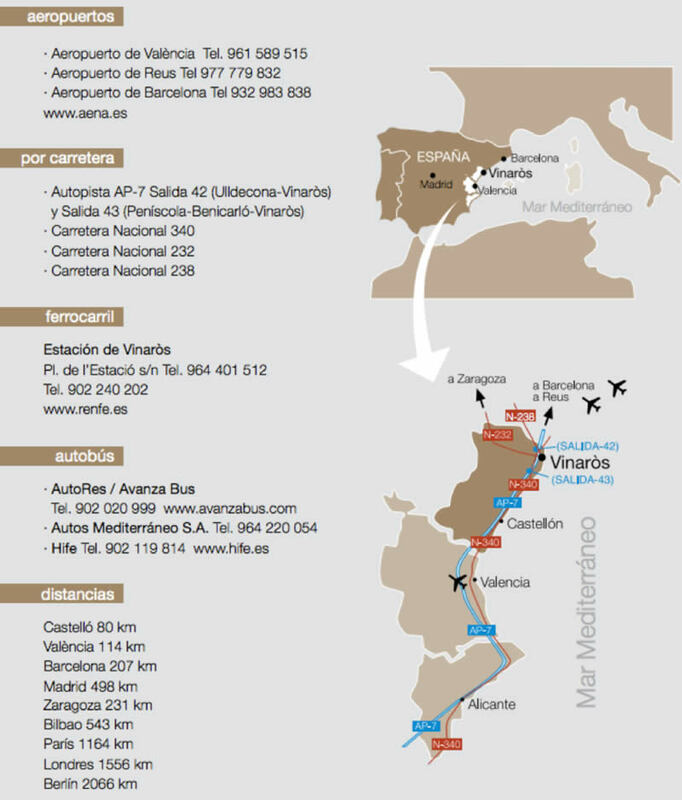 Located 55 km from Castellón Airport and 110 Km from Reus Airport, Vinaròs is connected to the rest of the peninsula through the AP-7 motorway, which has two detours that connect with the north of Spain via exit 42 - Ulldecona, Alcanar - and the south via exit 43 - Peñíscola, Benicarló, Vinaròs -, and the N-340 road, which borders the access to Vinaròs by any type of ground transportation. Address: Plaza de la Estación s/n, Vinaròs, 12500, Castellón. From September 2015 Vinaròs is further connected by air with the opening of Castellon Airport just 48km away. The airport operates weekly flights to the UK (London and Bristol) and Romania (Bucharest) and plans to increase its offer in the near future. You can find more information on their website www.aeropuerto-castellon.com. Other options nearby are Reus and Manises, with regular flights to different parts of Spain and Europe. Even Barcelona Airport is just two hours and comfortably connected by train. If you want to know more about our host city, or if you have any questions, please do not hesitate to contact the Tourist Information Office of Vinaròs through its website www.turisme.vinaros.es, calling their number +34 964 453 334 or THROUGH THEIR EMAIL vinaros@touristinfo.net.